This translation was commissioned by Peter Moores for a new recording in the Chandos Opera in English series. It was recorded at Blackheath Concert Halls in the summer of 2003, the conductor was David Parry and the cast included Susan Patterson, Dennis O’Neill and Anthony Michaels-Moore. The first stage performance was given by Surrey Opera in 2006. 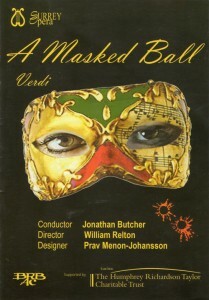 The production, by William Relton, was conducted by Jonathan Butcher. and will my beloved be faithfully waiting? She wept when we parted, so sweet and kind-hearted. defying the anger descending on me. no, no, no, no, no horror will stop me sailing the sea. no horror will stop him sailing the sea. my ears always ringing with songs I love singing. nor all of those beautiful things you have said. no, no, no, no, no fear and no terror will enter my head. No fear and no terror will enter his head.